"I'm calling about a missing boy." Netflix has released a new US trailer for the film Happy as Lazzaro, originally titled Lazzaro felice, the latest film by acclaimed Italian filmmaker Alice Rohrwacher (Corpo Celeste, The Wonders). This trailer celebrates the release of the film on Netflix today, for those who would like to catch this acclaimed, shot-on-film fable. It first premiered at the Cannes Film Festival this summer, highly regarded as one of the best of the festival, despite not winning any awards. The film is about a boy named Lazzaro who works as a farming peasant on a tobacco farm in Italy. About halfway through, the film jumps in time to the modern day where he ends up in a city searching for his friends and family. Adriano Tardiolo stars as Lazzaro, along with Luca Chikovani, Agnese Graziani, Alba Rohrwacher, Sergi López, Natalino Balasso, Tommaso Ragno, and Nicoletta Braschi. This US trailer is pretty much the same as the international trailer, but they removed the title cards and added a few seconds more of footage. This is the tale of a meeting between Lazzaro (Adriano Tardiolo), a young peasant so good that he is often mistaken for simple-minded, and Tancredi (Luca Chikovani), a young nobleman cursed by imagination. Life in their isolated pastoral village Inviolata is dominated by the terrible ­Marchesa­­ Alfonsina­de­ Luna,­ the­queen­ of­­ cigarettes.­ A loyal bond is sealed when Tancredi asks Lazzaro to help him orchestrate his own kidnapping. This strange and improbable alliance is a revelation for Lazzaro. A friendship so precious that it will travel in time and transport Lazzaro in search of Tancredi. His first­ time­ in­ the big­ city,­ he is­ like­ a­ fragment­ of the past lost in the modern world. 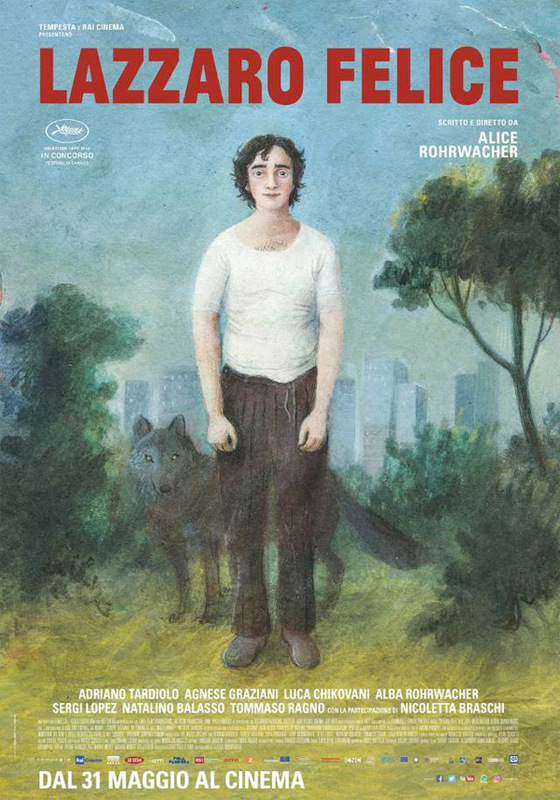 Happy as Lazzaro is both written and directed by acclaimed Italian filmmaker Alice Rohrwacher, of the films Corpo Celeste and The Wonders previously. This first premiered at the Cannes Film Festival earlier this year in competition. The film already opened in Europe this fall. Netflix will release Rohrwacher's Happy as Lazzaro streaming starting November 30th.